22 | November | 2017 | A balanced diet . . . 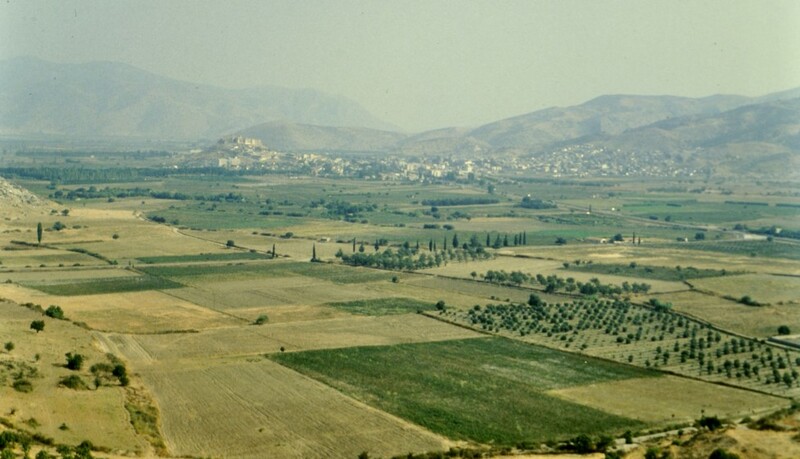 If you are interested in the origins of the crops we grow, as I am, and the history of civilizations in general, then a visit to the eastern Mediterranean and the Middle East must be high on your list of travel destinations. This area encompasses the so-called Fertile Crescent, one of the cradles of agriculture dating back some 10,000 years. As I recently wrote, I had an interesting visit to Israel in 1982, and saw many of the wild relatives of wheat and barley, and legumes such as lentil and chickpea, growing in their native habitats, and learning more about the importance of ecology in the evolution of these plant populations. I have also visited Syria a couple of times. The first time was in January 1995 when the CGIAR’s Inter-Center Working Group on Genetic Resources held its annual meeting at the International Center for Agricultural Research in the Dry Areas (ICARDA) in Aleppo¹. The second time was in 2000 when I went for a job interview at ICARDA. On both occasions I had overnight stops in Damascus, and on the second had the opportunity of touring the city, exploring the famous souk, and purchasing some beautifully-woven fabrics. I regret there was never enough time to explore Damascus and its region, or visit Palmyra, the World Heritage Site of an ancient Semitic city that has been in the news in recent years after the philistines of Daesh (Isis, IS, ISIL, so-called Islamic State) destroyed so many of its iconic buildings and priceless artefacts. Paul the Apostle will be forever associated with Damascus, as it was supposedly on the road to that city that he had his ‘Damascene experience‘. I was never struck the same way. He spent some months, after his conversion to Christianity, in the city of Ephesus that was once one of the most important port cities of Ancient Greece, on the western coast of Turkey. Did St Paul set sail from Ephesus to Rome? It seems a plausible conclusion. 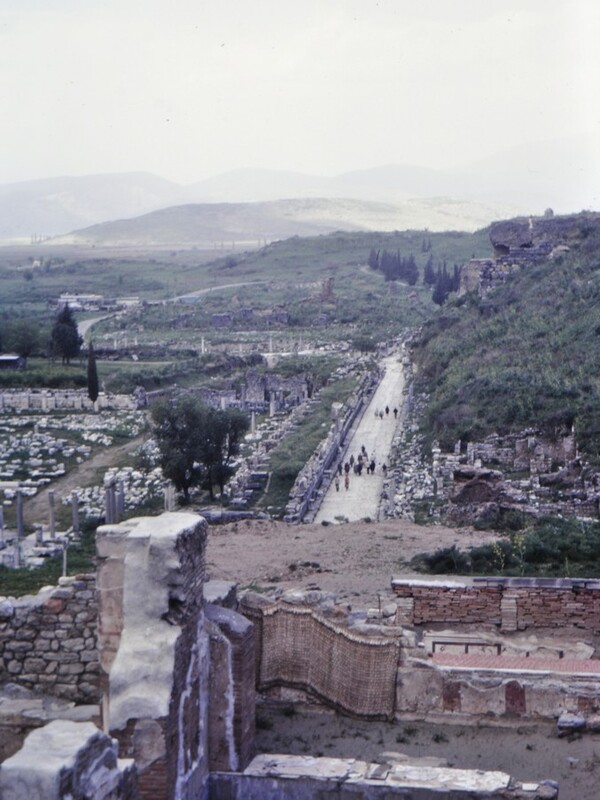 And, of course, Ephesus became immortalized in Paul’s Letter (Epistle) to the Ephesians, the tenth book of the Bible’s New Testament that was written from Rome. But perhaps not by him after all. 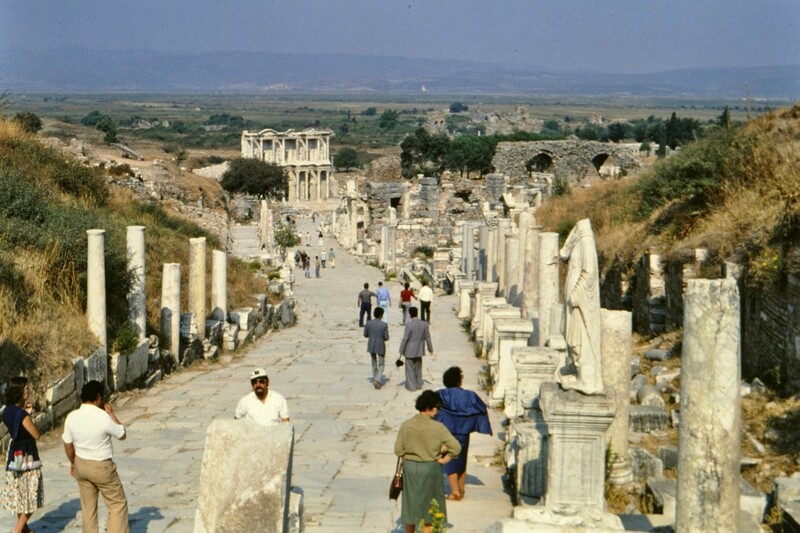 I’ve had the good fortune to visit Ephesus on two occasions. 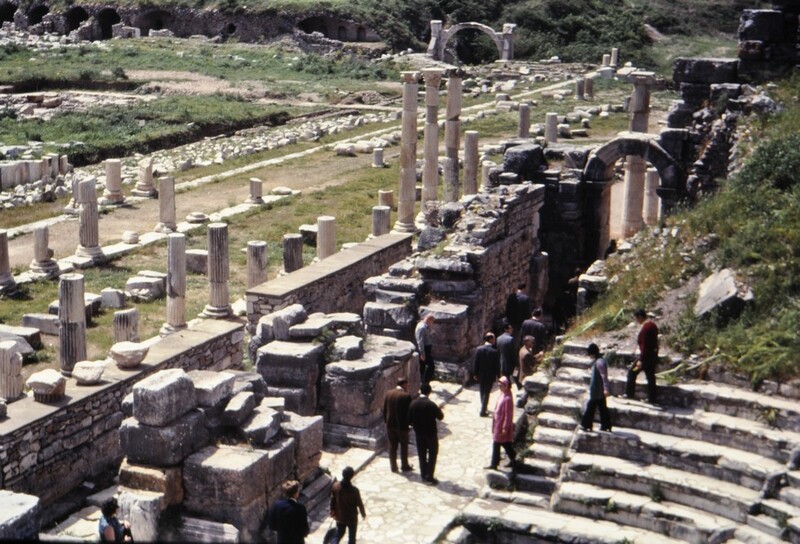 In April 1972 I attended a meeting² in Izmir, about 80 km north of the site of Ephesus. Then, in about 1978 or 1979, while on home-leave in the UK, I attended another meeting in Izmir, this time on potatoes organized by the International Potato Center’s regional program based in that city. And we enjoyed another excursion south to Ephesus. Just the other day, I came across a set of 35 mm slides from both trips, and that has been the impetus for this blog post. Approaching the site of Ephesus, the first thing you see is a hill fort at the town of Selçuk, that grew up alongside the ancient city. I’ve read that the Ayasuluk fortress is Byzantine, and that the walls date from the Seljuk period (11th and 12th centuries) and Ottoman empire that superseded it. 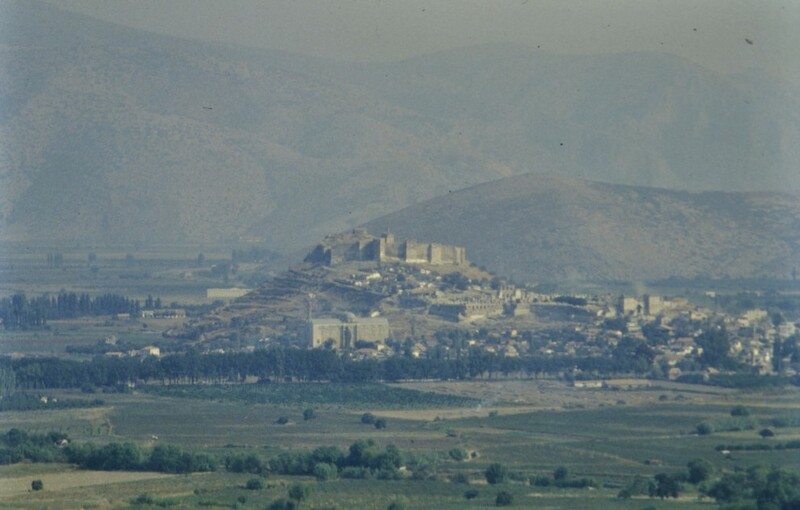 Below the fortress lies the Basilica of St John the Baptist, who spent his last years at Ephesus and is reported to be buried here. The Basilica was built in the 6th century by Byzantine Emperor Justinian I. 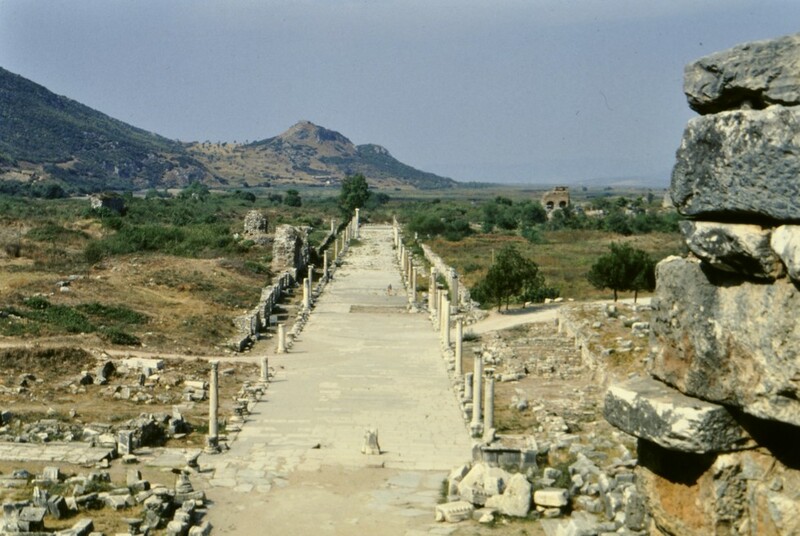 The region around Ephesus has been occupied for more than 8000 years. The site of Ephesus itself is indeed impressive. A brief description of each of the locations on the map can be found here. 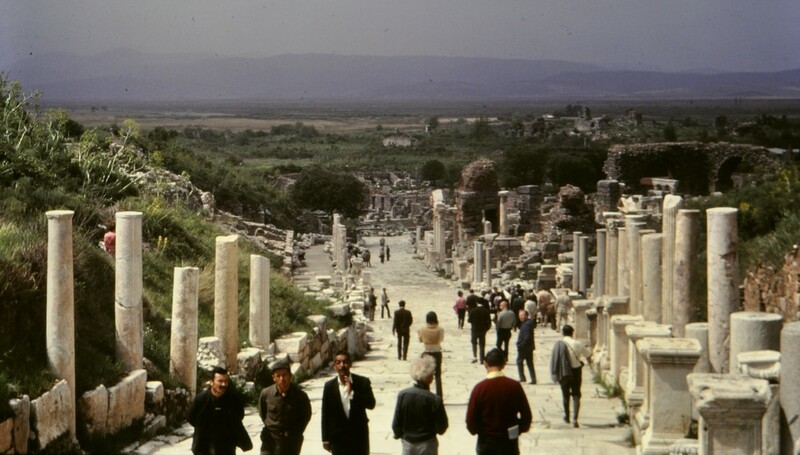 Entering the city along Curetes Street, with a view of the Library of Celsus in the distance, one can’t help wondering about the three millennia of history since its founding. Of course Ephesus has strong links with the founding and dissemination of Christianity in the Middle East and westwards through the Mediterranean, a region where three great religions of Juadaism, Christianity, and Islam came together, and in conflict regrettably. 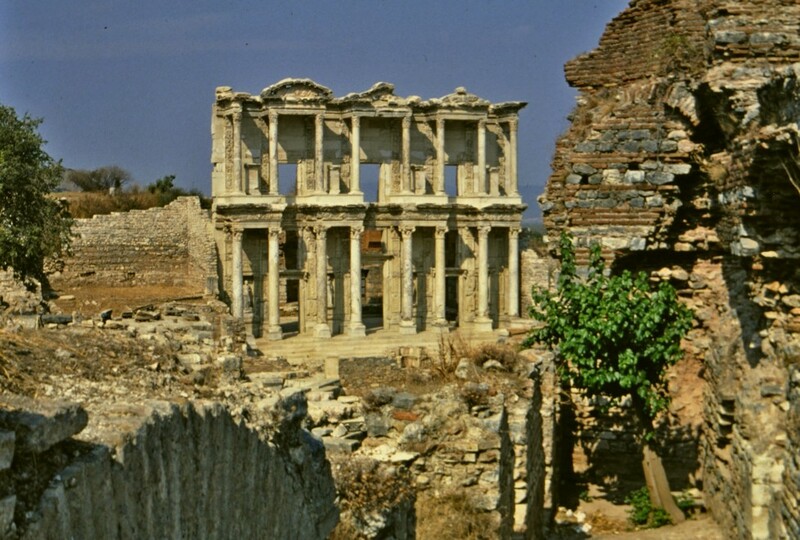 When I first visited Ephesus, the Library of Celsus was in ruins, destroyed by an earthquake. By the end of the 70s it had been partially reconstructed. 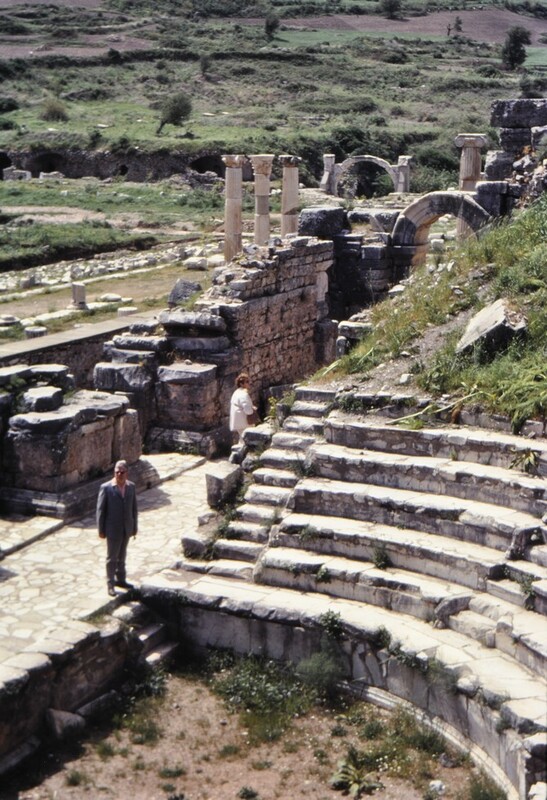 In the upper part of Ephesus alongside Curetes Street, lies the Odeon (a sort of mini-theater). 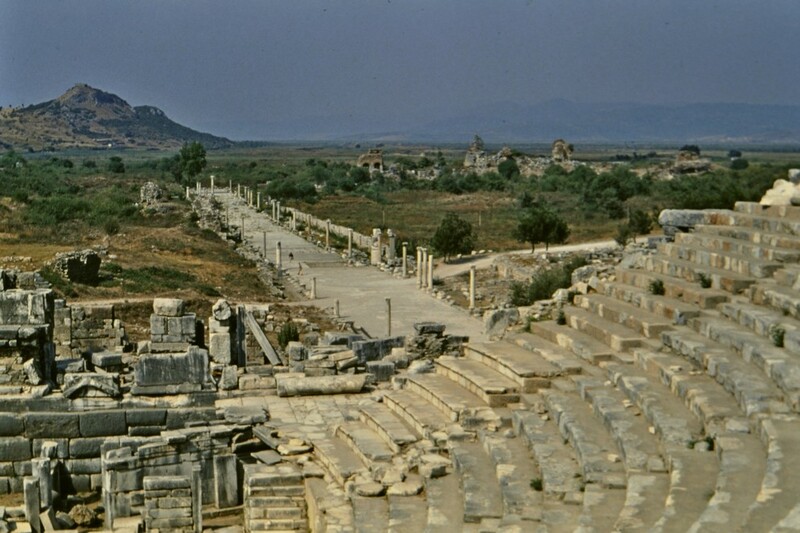 Then, further down the street, also on the right, is the Temple of Hadrian. 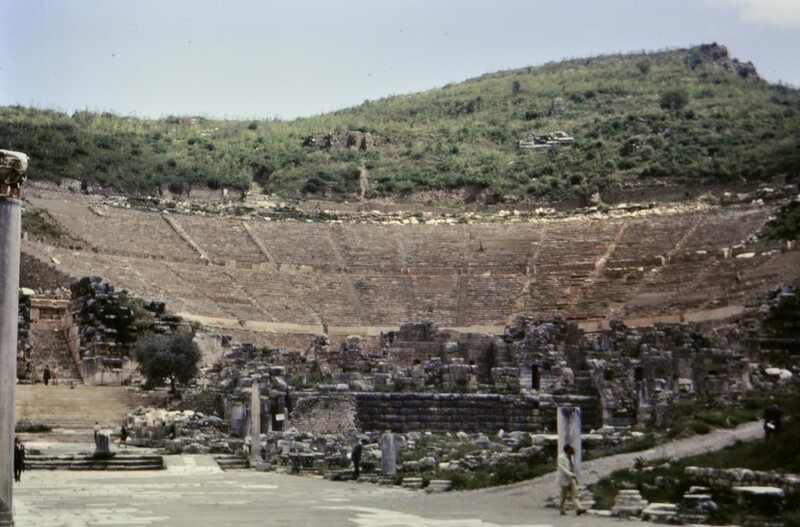 Past the Library of Celsus, Marble Street brings you to the mighty Theater of Ephesus, or Great Theater, which took 60 years to build. From the theater there are views along Harbour Street to the west. The sea is now more than three kilometers away. There are the remains of many other buildings, isolated columns, mosaics, and statues lying around the site. Unfortunately, I no longer recall where these photos were taken around the city. 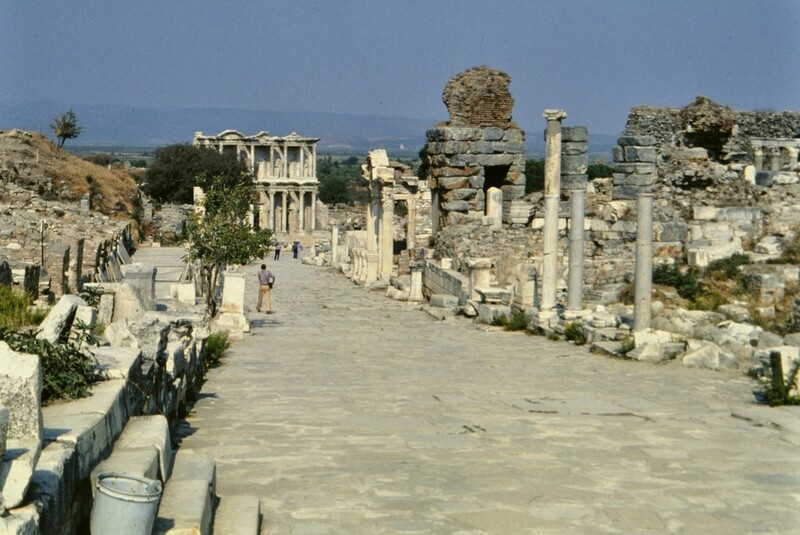 Nevertheless, they show the beauty and magnificence of what Ephesus must have once looked like. 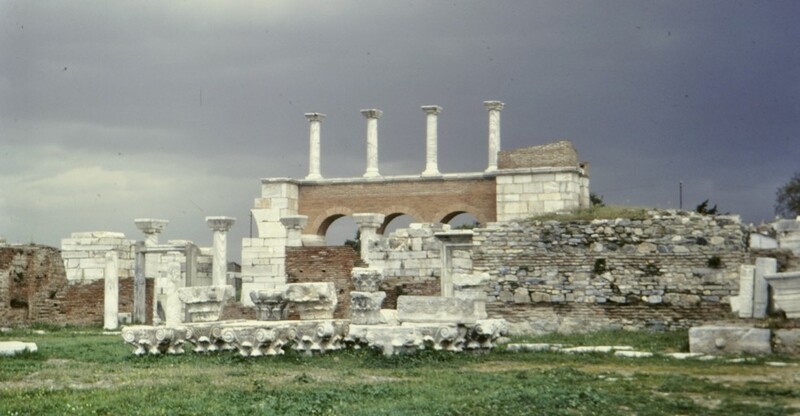 Among the distinguished residents of Ephesus was Heraclitus, a Greek philosopher who died around 475 BC, whose writing is known only as a series of fragments. I wonder in which corners of this once great city Heraclitus found solitude on which to ponder the nature of life and relationships? ¹ Due to the civil war in Syria, and the destruction of much of Aleppo, ICARDA has now moved to new sites in Lebanon and Morocco. ² Hawkes, JG & W Lange (eds.) 1973. European and regional gene banks. Proceedings of a Conference on European and Regional Gene Banks, Izmir, Turkey, 10-15 April, 1972. Wageningen, EUCARPIA.